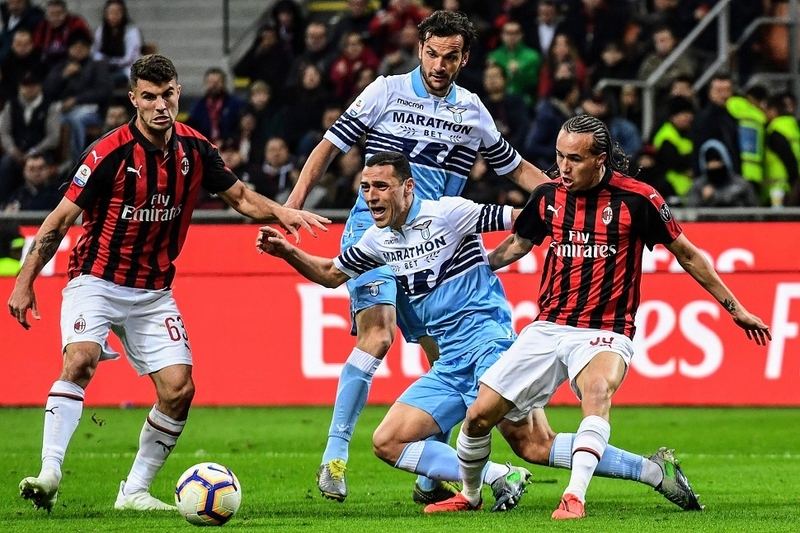 AC Milan strengthened their grip on fourth place in Serie A with a tense 1-0 win over Lazio at San Siro on Saturday that ended with a scuffle breaking out between players from both sides. Gennaro Gattuso’s side knew they had to win to remain in the final Champions League qualification spot after AS Roma had defeated Udinese 1-0 earlier in the day. Franck Kessie’s penalty 10 minutes from time secured a vital three points for Milan against one of their rivals in the race for a top-four finish, extending their lead over Lazio to six points. However, Lazio have a game in hand. Tensions spilled over after the final whistle as a melee broke out between the two sets of players who will face off again at the San Siro on April 24 in the second leg of the Coppa Italia semi-final. The first leg ended goalless in Rome. “I even gave myself a thigh strain running over to calm everyone down,” Gattuso told DAZN. “I was on the bench, I saw some words were flying between the sets of players. The important thing is that it ends there. Ciro Immobile threatened for Lazio early on as his low shot drew an agile save from Pepe Reina and the Italy striker came close again just before halftime when his angled finish came back off the outside of the post. The home team created chances of their own as Krzysztof Piatek headed narrowly wide on the half-hour mark before the Pole had a shot charged down by goalkeeper Thomas Strakosha after the break. With just over 10 minutes remaining, referee Gianluca Rocchi awarded Milan a penalty for handball, only for the decision to be overturned following a video assistant referee (VAR) review. However, only a minute later Rocchi again pointed to the spot when Lazio substitute Riza Durmisi barged into Mateo Musacchio inside the area, and Kessie stepped up to send the goalkeeper the wrong way from 12 yards. Strakosha acrobatically tipped away a curling effort from Suso in stoppage time, before Lazio had their own penalty appeals waved away following Ricardo Rodriguez’s tackle on Sergej Milinkovic-Savic.